If you can get past all its bluster, February tends to be kind of a romantic month. Brides need to start getting organized, choosing gowns, finding photographers, booking halls, and on and on. And smack dab in the middle of the month is Valentine's Day. My days of courtship may be long behind me, but I still consider myself a romantic. I love lingering over a candlelight dinner, soft music in the background. I love quiet nights and conversation with a glass of wine. I love that surprise gift — an offer to clean up the kitchen because he knows I'm tired, a new CD he bought just because there was a song that made him think of me. I love a bouquet of wildflowers picked on a summer afternoon. Romantic gestures aren't difficult to extend. You don't need to be imaginative or creative. There are some symbols that are intrinsic, that are a deep-rooted association with the notions of love and romance, that on their own are all that's needed. Who doesn't associate hearts and flowers with devotion and ardour? Oscar Wilde neatly packaged the two together when he said, "Keep love in your heart. A life without it is like a sunless garden when the flowers are dead." 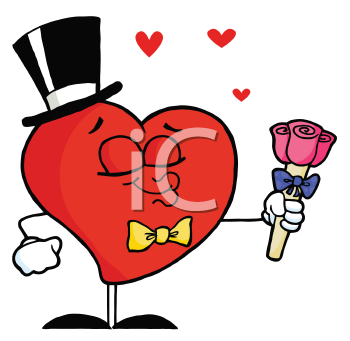 So on this wintry February day, may these clipart collections of hearts and flowers bring a little romance your way.